Craft has healed many of my own generational wounds and brought me back to spirit. We all need it, whether we know it or not. In the absence of hand-made things, our culture is lost. Just as connecting with our food brings greater meaning to our lives, so connecting with the people who make everyday items brings meaning to the things we use in day to day life. When items are made by hand, they have their own soul, teachings and memories to share with us. Tradition creates lineage, and that lineage connects us to the birth of time and the creation of the universe. The photos below are of a sturgeon nose canoe, which I've been enamored with since moving to this region. The boat was created by a super cool guy I met, Shawn Brigman, http://shawn-brigman.squarespace.com/ who was kind enough to let us paddle her. Traditionally the skin of the boat was made with inverted Western white pine bark, but we've lost many of that relative to blight decades ago and we are less culturally rich for it. It's not humans by themselves who create culture. Culture is born out of our relationship with the earth and each other. If you want to save your culture, turn to the earth and begin anew. Collin and his crew just finished assembling the bones of an owl-shaped treehouse set in an Olympia, Washington, rainforest for the Previous Man film his friend Sean O'Connor wrote and is directing. The film features another friend, Shane O'Grady, as actor and producer, with the star role going to Daniel Higgs, the deeply-bearded lead singer of Lungfish, whom Shane called an "embodier" rather than an actor. The Owl House, as it's been dubbed, is a finessed timber frame structure of fir, walnut and birch, finished with a light round of sho sugi ban carbon charring, and between the heavy-mossed firs of the coastal rainforest, under the canopy of wet leaves, the dark wood with its burned grain is expansive, heart-opening; and yet also constraining, unsettling. It is exactly what Sean and Shane envisioned for the way the Owl House plays into the development of the film's main character. Collin's crew — Dave and Hank, with the on-site addition of Johnny — worked hard on the raising, and Dave and Hank stayed to finish the structure's staircase. In the coming days, the lighter wood of the flooring will be stained and the structure will be finished out by Olympia-based Pete Chramiec's crew. Lowering the ceiling joists into their respective places. The fir got a heavier layer of charring than the naturally darker walnut. The lighter flooring isn't finished. In the end, it will all be dark. The crew under the finished frame: Collin, Johnny, Hank and Dave. I lie on my back, belly gently rising and falling. My eyes soak in the beams above me, shaped from trees grown from seeds that fell to the forest floor during the time of my great grandmother and great grandfather. All of my senses are enveloped and put at ease. I breathe in the woodsy scent of nature shaped by devoted handwork. Like the many bones of my body, small timbers meet medium timbers, and those in turn meet large timbers. I feel the same calmness and ease I do standing in a conifer forest, with towering evergreens rising above me. Where I feel loved and simply ok with my body, my mind, my flaws and my life. It feels as if the cells in my body are slowing down. The stresses from my life disappear and are replaced by beauty lit in a warm, golden light. This place eases the woes and rebuilds me. The closest thing I can compare it to is lying in your beloved's arms after making love. Your bodies still entwined, the ego subdues and your souls merge. Yes, that's it. It's the type of healing that comes from the stillness within and from those who unconditionally love you. Yes, this is a home, and it's where you reside. My homes are where shinrin-yoku (forest bathing) and craft meet. Shinrin-yoku is a Japanese practice where you allow nature to enter all five senses of your body. Our ancestors were immersed in nature, and the intelligence of the outdoors resets our minds and bodies. From the earth we came and to the earth we will return. And so my homes are filled with stones that spill from the river, natural slate back splashes that mimics the mountains outside, and seamless compositions of stone, earth and timber. We are honored to be featured in this summer's issue of Sandpoint Magazine with a wonderful home we built for some incredible clients. Reflections of our universe in design and craft. 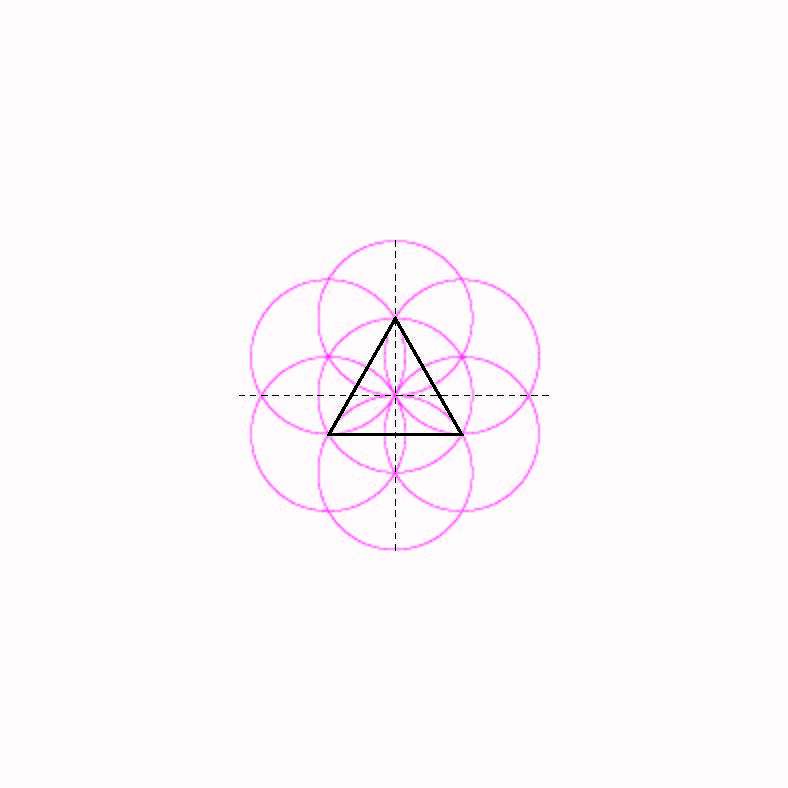 Guest post by Laurie Smith on geometry, continuing the discussion that was begun here. We are all intimately connected to the universe. At each new sunrise we witness the eternal geometry of the sun as it rises clear of the Earth’s horizon and its light, in flight through space, enters our eyes and burns its image on our retinas. The sun, the Earth, and our eyes are all spherical and our irises are circular. Circularity is fundamental to movement. Inside the dark Earth we can find minerals, cooled from molten lava into crystals with triangular, square and hexagonal sections, the three angular shapes that pack together without intervening space. Angularity inhibits movement and provides stability. Circularity and angularity are opposite yet interrelated geometrical forces that govern our world and, like male and female, their fusion brings harmony and strength. The carpenter knows that inside the circularity of a tree there is an angular timber, stable and strong, a part of the natural world that is perfect for building. When the structure of our world is governed geometrically, what could be more natural than to design using geometry, a spatial language that gives us good proportions and buildings that are in harmony with our surroundings. The geometrical module above left, which was carved into a timber of a Welsh hall-house in 1460, can be opened like a flower to design the building’s section, lower left, which shows the hall’s nave, aisles and massive spere posts. Draw two lines that cross at right angles and where they cross draw a circle. The circle is a plan of the Sun, the Earth and the Moon. Draw six more circles around the circumference of the first and you will discover that they fit exactly. And then, if you draw straight lines between the points where circles overlap, you can construct a triangle, square and hexagon, the three angular plans of mineral crystals. The hexagon is also the plan of a bee’s honeycomb cell, and if you draw straight lines between the hexagon’s angles, the plan of a snowflake. 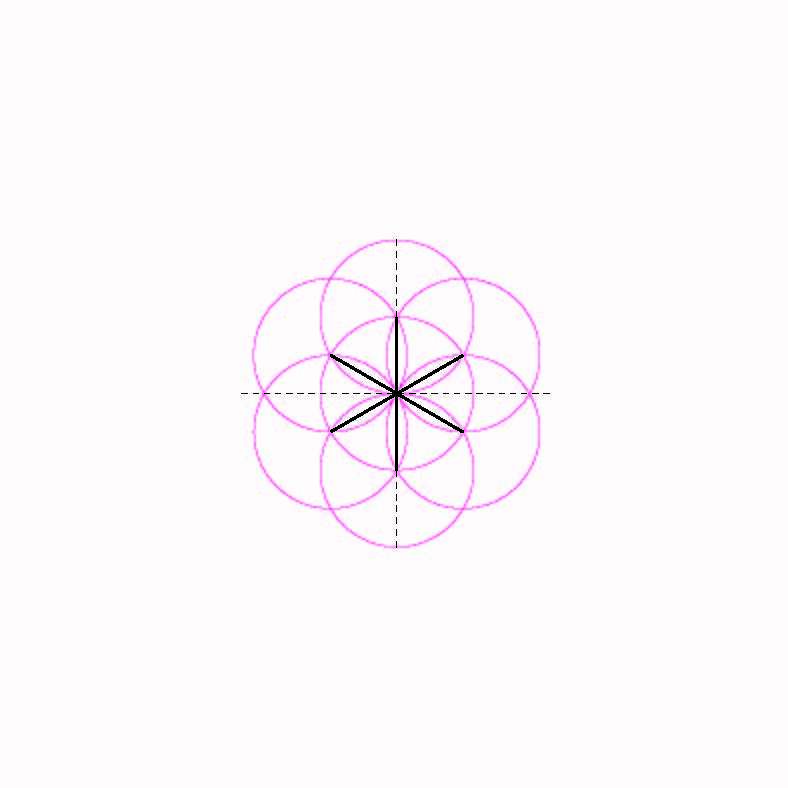 Each circle is the plan of a bird’s nest and the circles overlap to form the petals of a flower. The natural world is designed to geometrical proportions. When we design our own homes we can choose to follow nature’s path. The simple geometry described above and related compass geometries have been used to design buildings for at least a thousand years, right up to the present day. Geometrical design brings good proportions and simplicity of form, qualities that are in harmony with the natural world and pleasant to live within. When I'm making curved knee braces for our frames, rather than cut curves out of straight material, I procure trees that have grown with curves already in them. This means, first of all, that there is no short grain runout, which makes the brace stronger, and secondly it means that each knee brace is bespoke — original; beautiful. Finding this material takes a great amount of knowledge, time and energy, and above all a developed artistic eye. The artistic eye begins in the forest, in the tree selection itself, and ends in your home. I air dry our brace stock to insure dimensional stability. The result is a stronger and much lovelier knee brace that is completely unique to your project. Hand selecting crooked timber. What is typically used for firewood now becomes the highest expression of the craft. The second step is to slab the timbers on two sides. A finished brace on top of an unfinished brace. Douglas Fir brace in the shop. Douglas Fir braces in use. Craftsmanship is a word that gets tossed around by many people, but in most cases it does not actually apply to the built environment that we share. We have diminished the definition of craftsmanship to allow entry for anyone — and in doing so we have lost touch with what is possible with training and dedication. We've traded real craftsmanship for manufactured materials that can be installed by the least skilled labor available. And it's not always financial limitations that are driving the choice towards utilizing this type of labor. Often what I see is there is simply no forethought or skill employed, due to individuals and companies that have no business being involved in building. The ubiquitous pickup truck, skill saw and dog appear to be their only qualifications. What we ask from a home today is much more complex than it was 50, 100, or 500 years ago. It's imperative that the builders of today not only have developed themselves in craft, but also keep up with building science and green technology. This is one reason why resurrecting traditions such as the Timber Framers Guild is so important: it gives builders outside accountability and stringent standards to compare their work to. Our work stands out because of our exemplary training and forethought, which we bring to all aspects of our projects. We bring in decades of dedicated craft training, and the value of that for a client cannot be overstated. We're striving to raise the bar and standards in our community and elsewhere. All too often people approach me and tell me that they really wished they would have had my company do the work for their home. They have regrets and were often led down a direction that they are ultimately unhappy with. Building a home is often a once-in-a-lifetime opportunity, and no matter the size, it is one of the largest investments a person, or company can make. Why risk your project to mediocrity, when you can work with the best? Our clients come from all walks of life, but the one things they share in common is a desire to create something with integrity, intention and beauty. A home is your sanctuary and your protection from the natural elements. Sometimes those elements dish out more than is expected. Last night, Sandpoint, Idaho, and its surrounding areas suffered wind storms that knocked out electricity and damaged many homes, primarily due to trees falling on them. One of the first homes I designed and built suffered multiple blows by very large trees, but held strong. When I went inside to tally the destruction, I saw that the timber frame had remained intact and true, thus protecting the interior from any damage. On this home we installed a cedar shake roof, which is easy to replace, reuse, and recycle. If this was an asphalt roof, the landfill would be its next home. Wood is an enduring material because of its easy repairability, strength, longevity, low embodied energy to produce, and lasting beauty. For centuries, timber frame homes have offered that extra assurance of security and safety, and they still do that today. 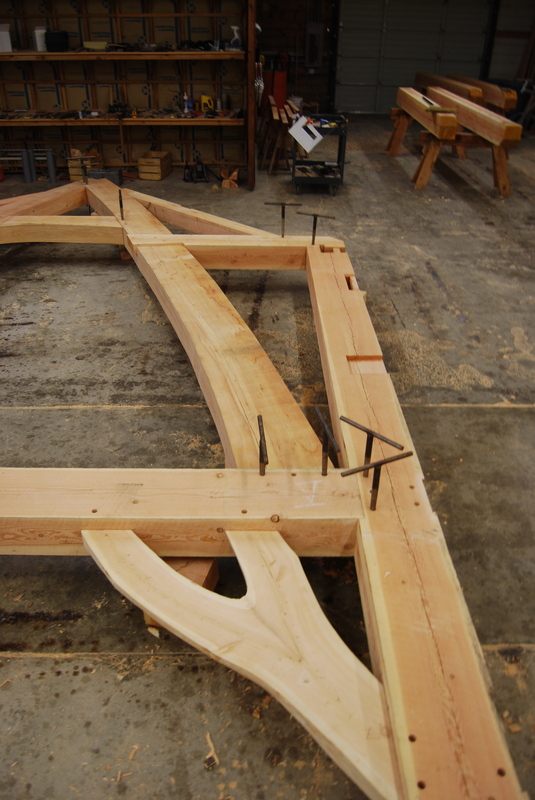 As a craft tradition, Timber Framing has utilized green wood — in this case, meaning freshly-cut or still living — since its inception. Throughout the ages, carpenters refined a system of joinery to work with live wood. Joinery, as the name suggests, is a method of bringing and holding timbers together. Using various species of green wood keeps our local economy vibrant by supporting smaller scale sawyers, and all others who make their living from our forests. Millions of Timber Frame structures from the twelfth century onward have been joined in green wood and are still in active use today. Being joined in green wood means these timbers go through transformations as they dry. Drawpinning, or drawboring, keeps everything in place. This is the process in which the craftsman drills holes in the timbers and sets pegs in them, offsetting one peg, called the tenon peg, from another peg, called the mortice peg. This allows the peg to draw the joint tight and hold it tight throughout the drying process. As you can imagine, these little pegs need to be strong, so we make them by hand to ensure that they are. Using a club, froe and shaving horse, we rive pegs from billets. Riving or splitting keeps the long grain of the peg intact, affording it the most strength.